Tessa has taught herself Heart and Soul on the piano, and we’ll often play it as a duet (“often” as in a bazillion times a day). The other night she asked me to play her a different song, so I pulled out my sheet music from Edvard Grieg’s Wedding Day at Troldhaugen, which I labored over while I was in high school — the peak of my piano talent. In moments like this, I am reminded how much I used to love the world of arpeggios and key signatures and smallish busts of old composers with weird hair. Music — piano and flute — was so important to my sense of self when I was Tessa’s age. Let’s say there have been a few years of skill atrophy. This is how Wedding Day is supposed to sound. I did a respectable job playing it for Tessa, but I have been capable of so much more. No matter. The song lasts longer than Tessa’s usual attention span, and she surprises me by not stopping to move onto something else. 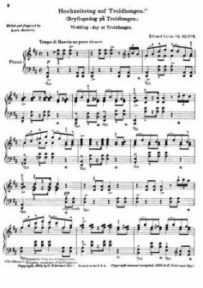 When we get to a particularly difficult part — the page filled with flyspecks (as Roger says of written music) and the sounds you hear at 1:30 — Tessa looks up at me with pure admiration and love in her eyes, as if I am Edvard Grieg himself, reincarnated as her mom. Seeing myself through her wondrous eyes was pitch perfect. On the 4th Monday of each month we engage in mindfulness about something that is right with our world. Everyone is welcome to join. The next Perfect Moment Monday event will be on March 26. Playing piano is quite an impressive techincal skill, if you do it well or if you’re rusty. So Tessa is righfully in awe! I took dance lessons and clarinet (I really wish i knew how to play piano) so this really spoke to me, I think it’s wonderful that you can share this with Tessa and it speaks to the HEART of you. I know that Jacob LOOOOOVES music and I am doing all I can to make sure that he starts lessons soon and gets to share all the happiness it brings him with us. What a beautiful moment, Lori. And it’s so aweseme that you share the love of music with your daughter. My youngest used to take piano lessons and loved it. You can’t buy that! Beautiful moment. Oh I love this post. I took piano lessons for years and I am so rusty now. I can’t tell you the list time I touched the lovely ivory keys on my piano. How beautiful that Tessa’s attention was held for so long and that she has a new admiration for you. As you said in your comment on my Gatekeeping post the other day, it seems like piano was to you in your youth, what dancing was for me. I think it is so important for everyone, especially children and teenagers, to have a creative outlet/way they can express themselves. I agree it does so much four our sense of selves and is so healthy all around. Does this mean you’re going to start piano lessons again 🙂 I’ll keep up my guitar lessons and we’ll start a band.